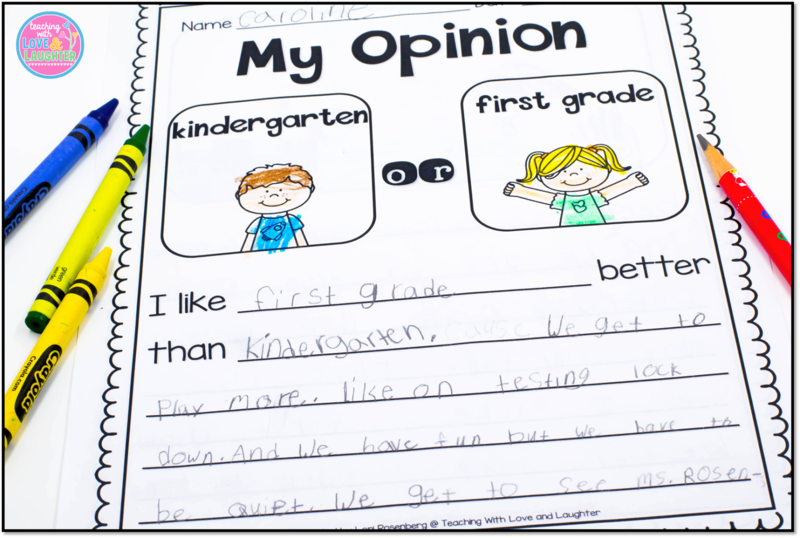 Teaching With Love and Laughter: Opinion Writing and More! Opinion writing is, hands down, my favorite type of writing to teach. It's always amusing to see what the children think about topics that are near and dear to them. And, children are always excited to voice their opinion and give reasons why they think the way they do about various topics. I'm the kind of teacher who likes to teach a certain skill and then have plenty of ways my students can keep practicing that skill for the rest of the school year. I do this with all subjects that I teach. Teaching something a few times and then moving on to the next skill, is a big pet peeve of mine. When it comes to opinion writing, I teach the basics and then give my students all year long to grow and develop as writers. Using graphic organizers helps my students plan their writing. 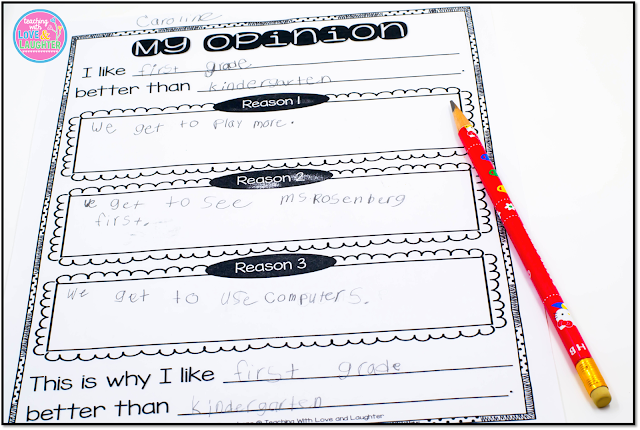 This opinion writing graphic organizer has space for them to list two different topics and choose their favorite. Then, they give three reasons why it is their favorite. Finally, they write a conclusion sentence. In the beginning of the year, the children basically copy the information from their graphic organizer onto their final piece. Once they begin to develop as writers, they are able to take it to the next level and add details to support their reasons, like in the example below. Once they master this template, they move on to the one shown at the beginning of this post, and use the graphic organizer. I like to meet with each writer after they fill out their graphic organizer and help them edit their piece. Then, they copy it onto their final writing template, adding details, if they are ready to do so. 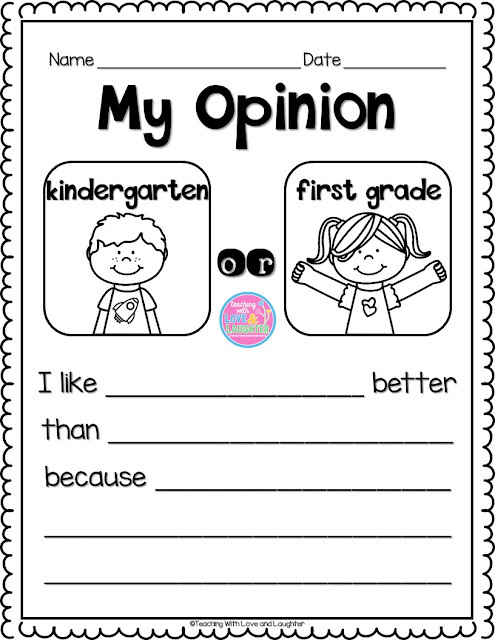 I have so many of these opinion writing templates and leave one or two at my writing station every week, along with a supply of graphic organizers. Most of the topics are seasonal or thematic, so they go along with the time of year or theme we are concentrating on. If you would like to purchase these opinion writing templates for your students, you can either purchase them in monthly packs or in a bundle with tons of other writing templates. These packs definitely take the work and worry out of planning for writing each week! Click on each image below to see my monthly writing bundles, which contain writing templates for all genres. Just print, keep a supply of them in your writing center, and you are all planned for the entire year! Make sure to check out this blog post for more information on this writing series. 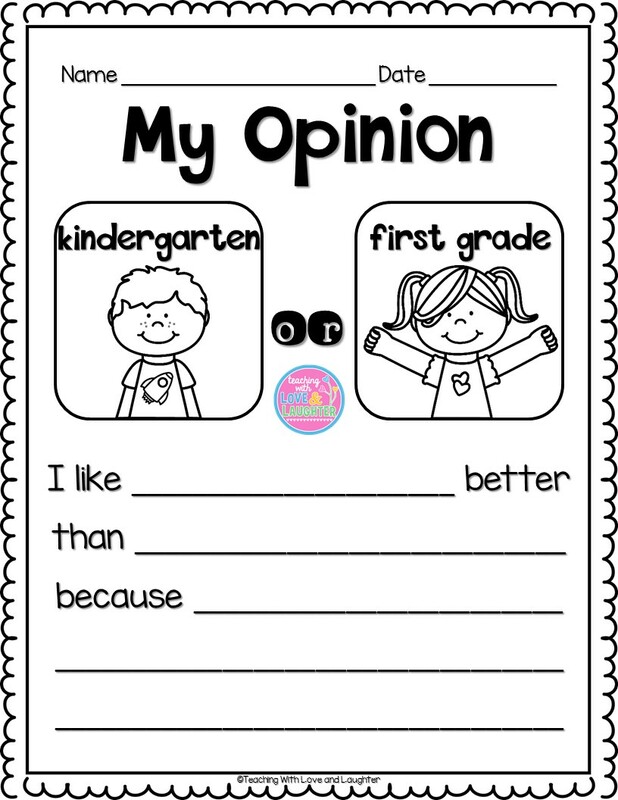 If you would prefer to purchase just the opinion writing templates, click on each image below to see them in my store! 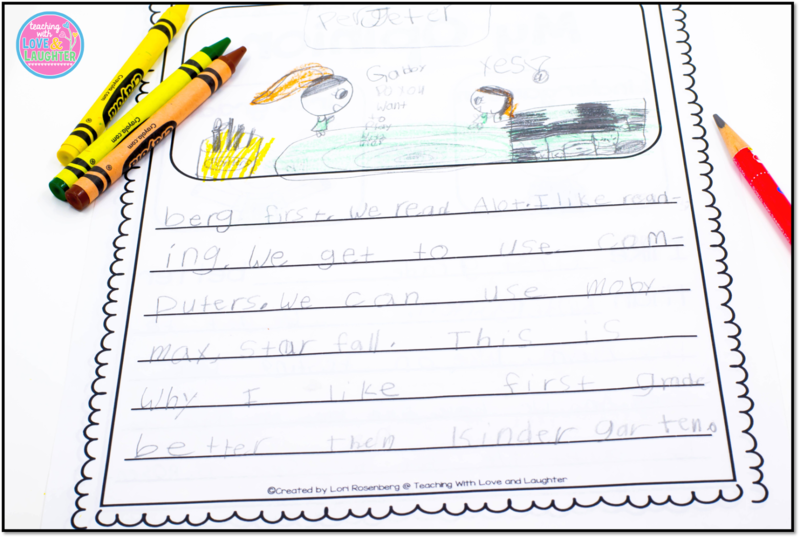 These writing templates make planning for writing instruction a breeze!